Why can't you just visualize a crosswalk, then step into traffic? You are here: Home / manifestation / Why can’t you just visualize a crosswalk, then step into traffic? But why is it creepy? Fawn gives me the answer. What is wrong with this picture? What is the problem with this woman staying home reading baby books, and visualizing having the life she longs for? I was racking my brains trying to figure this out, when my wife Fawn came up with an example that explained it. Imagine you lived on a busy street, and you find yourself really longing for a new traffic signal and crosswalk by your house. 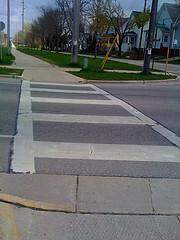 You really want that crosswalk, and you want to attract that change into your life. But if you wandered blithely out into traffic as if the traffic signal was already there, expecting cars to stop the way they would at a crosswalk, you would be in for a very nasty surprise. The sad fact is, no matter how well you had visualized that traffic signal and crosswalk, and no matter how well you were “Making the space for it” by living like it was already there, you’d be a fool to live as though it WAS there. Because it’s not there. And pretending it IS there is a good way to get run over. There’s a difference between living from a future vision, and living in that vision. One is an empowered space from which to take action. The other is a fantasy world of magical thinking that can get you hit by the realities of life. When you live from a vision of the future, you’ve felt a longing for a way your life could be — for instance, you could have a husband and child, or there could be a traffic signal near your house. Whatever it is, it’s a calling of your heart that draws you toward it. But most of the time, when you have a longing in your heart, there’s a reason that it hasn’t been fulfilled, and here it is: In some way, you have a hard time believing that possible future could actually come true. – You never even tried, because you grew up being taught that it simply wasn’t possible for you to have that heart’s longing fulfilled. For whatever reason, some part of your heart has given up on ever getting what you want. You’ve accepted that it’s impossible, even though accepting that has been heartbreaking. When you’ve lost heart, you have to attend to that loss of heart, if you ever want the future you’ve given up on to come true. You can’t simply live in a fantasy future, pretending you haven’t given up, and get the results you want out of life. It simply won’t work. You have to do the heart-level work that restores in you the feeling that you can, in fact, have what you want. Put another way, you have to do the work of clearing the painful beliefs that made you give up, so you can come to really believe in the possibility of your vision becoming true. You’ve got to get to the point where you feel the wonderful feeling of knowing that, even though you may have to make some effort to get what you want, the future isn’t written yet and you are most certainly not doomed to fail. When your heart knows this, you can live from the future you are trying to create. You get inspired to take action by your knowledge that the world you desire is possible for you. In fact, you become impossible to hold back. If you are longing for a husband and child, and you’ve cleared your blocking beliefs, and you know in your heart that it’s possible for you to have what you want, then you won’t just sit at home reading baby books. Let yourself feel how it would be to be in that woman’s shoes — only now having the knowledge that the bright future you desires is possible for you. Would you stay home reading baby books? More likely, you’d be inspired to take action, to meet men, to follow up on leads, and to get out and live a life that would put you around the kind of people who could help your dream come true. Similarly, if you longed for a traffic signal near your house, and you knew it was possible, you would be empowered to take action, to circulate petitions, to find out what needed to be done and who needed to be persuaded, to make your outcome a reality. You would not simply visualize it existing, then wander out into the street. When you live from your future vision, you feel the real possibility of your outcome happening, and allow that to inspire you to do what you need to do next. That kind of heart-based certainty — plus action — really does attract synchronicity and unpredictable positive accidents. Good things compound, and miracles happen. When you live in the future, on the other hand, you are simply fantasizing that you already have what you are after — which you don’t. Rather than being inspired to take action that can get a whole series of unexpected miracles to occur, you sit in the fantasy and do nothing. That doesn’t attract anything — at least not anything good — and is a disappointing way to live. – What is a longing of your heart that has yet to be fulfilled? Really let yourself acknowledge what it is. – Then answer this key question: How have you lost heart in that outcome? What is the block, or the difficulty — not in the world, but in your own belief system? Have you tried and failed once too often? Does it seem too hard? Do you simply not know how to begin? Or is it just that you’re doom, and that “people like you” never get that kind of thing to happen? What is the blocking belief that is stopping you? – And finally, do what it takes to transform that limiting belief into something positive, so you can have the motivation to take action, without having to struggle and suffer along the way. Now, I know it’s easy to say “do what it takes.” But I mean it. All of my work is about helping people get through those very moments, and I’m happy to assist you (see the end of this email for how), but the fact is you probably have some resources in your life right now you can use to make that kind of a change. If you have a support group, ask them to help you. If you have a therapist or coach, bring it to him or her. Just remember, you are not looking for advice — You are looking for someone to help facilitate a real transformation, so that this block no longer stops you, and you can be full of unambiguous energy toward pursuing your goal. You are not looking to be told “Just stop believing that.” That’s not enough to really change a limiting belief. When you’ve cleared away the beliefs that are stopping you, your future vision will be something you can live from, and you’ll be easily able to take actions to bring that vision into the world. I truly believe that this is how people change their lives, and how people change the world we all live in. I hope these guidelines will help you create the kind of change in your life that you are longing for. Sometimes we all need some assistance getting through a blocked place. If you have some area in your life where you have lost heart, or in which you feel stuck, or have given up, my coaching may be for you. My coaching is designed to help people heal the areas where they have “lost heart” in life, and to help them find the inner resource they need to go for their heart’s deepest longings.